According to the Union of Concerned Scientists, New Jersey is over-reliant on natural gas for power generation and as a result may be putting consumers at financial risk of potential price swings. A high percentage of homes in New Jersey already have access to natural gas for home heating and gas prices are among the lowest in the nation. According to the US Energy Information Administration, 64% of the gas imported into New Jersey via interstate pipelines passes through and is exported to other markets. Data from the U.S. Department of Energy shows that overall gas consumption in the Mid-Atlantic region (New Jersey, New York and Pennsylvania) is projected to decline over the coming decade, at least until 2025. Further policy changes to reduce dangerous emissions from greenhouse gases, improve energy efficiency and support growth of clean energy will only accelerate this decline in consumption. 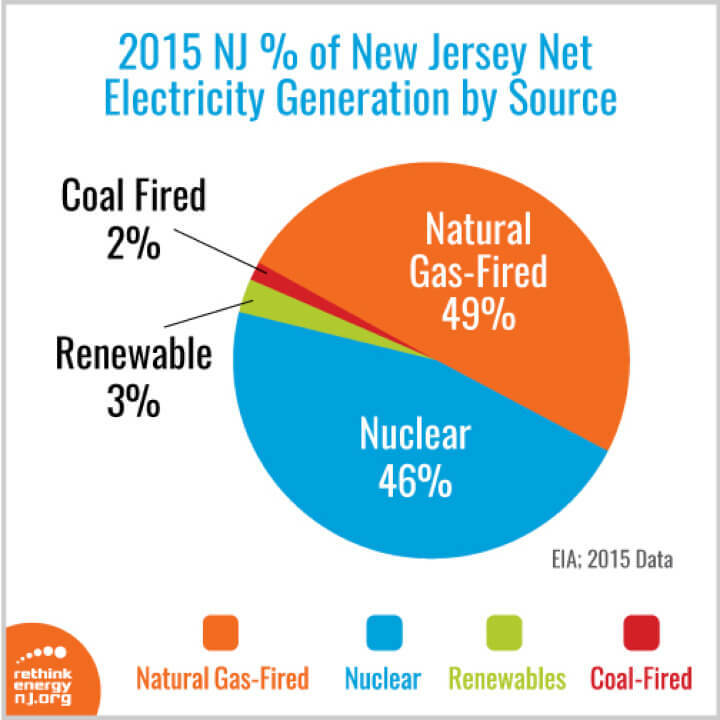 As shown in the chart below, natural gas currently accounts for nearly half of electricity generation in New Jersey. In order to reduce harmful and climate-changing emissions from electricity generation, we must reduce our dependence on natural gas. Contrast that with the fact that carbon emissions actually rose by 14% in New Jersey last year, largely due to carbon emissions from natural gas fired power plants, and the need to reduce reliance on natural gas is clear.